The UI Kit provides application architects and user interface (UI) designers with a sample end-user UI that reflects the latest design trends and Pega 7 Platform UI capabilities. With the UI Kit, you can take advantage of the most recent UI capabilities of the Pega 7 Platform to create your own modern, responsive UI in your applications. The UI Kit has two user portals: the Case Manager portal and the Case Worker portal. 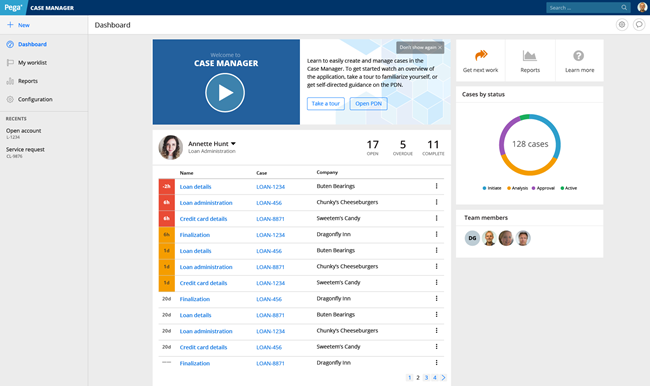 The initial version of the UI Kit, released as part of Pega 7.1.6, included only the Case Manager portal. The Case Worker portal was added to the second version, released as part of Pega 7.1.7. Both portals incorporate the latest Pega 7 Platform UI features to provide end-user interfaces that reflect the latest UI design trends. While you can use these portals as-is in your application, the UI Kit is intended to be used as a starting point for creating and customizing your own end-user UI. The UI Kit includes pyEndUser as the default skin for applications. When you create an application, the skin automatically inherits styles and formats from pyEndUser. To change a style in your application, you need to edit the style in your application’s stylesheet to override the formatting inherited from pyEndUser. Some user interface elements are disabled by default in the UI Kit. Smart layouts and panel sets are disabled because they are replaced by dynamic layouts and screen layouts. Repeat row columns, accordions, smart labels, and list views are disabled because those components are deprecated in Pega 7.2. The UI Kit is provided as a stand-alone ruleset, named UI-Kit-7. Unlike other rulesets that are provided as part of the Pega 7 Platform installation, the UI-Kit-7 ruleset is not a part of the PegaRULES application. Instead, Application Express adds the UI-Kit-7 ruleset to the application rule when you create an application that is based on the PegaRULES application. All applications created in Pega 7.1.6 and later versions incorporate the UI Kit automatically. 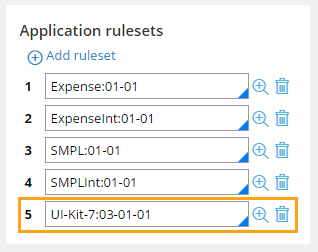 For applications that were created prior to 7.1.6 and migrated to a Pega 7.1.6 or later installation, add the appropriate version of the UI-Kit-7 ruleset to the list of application rulesets on the application rule. The UI-Kit-7 ruleset is not available on versions of the Pega 7 Platform prior to 7.1.6. Pegasystems publishes the UI-Kit-7 ruleset as a locked ruleset. To customize the Case Manager and Case Worker portals provided by the UI Kit, you must copy the rules to an unlocked application ruleset. If you plan on customizing the provided UI Kit portals, import the entire UI-Kit ruleset into your application ruleset. When upgrading your application, be sure to include your customized version of the UI-Kit when you upgrade to maintain your custom styles. Each update to the UI Kit is published as a new major release to avoid any conflicts arising from the effects of rule resolution. This also allows you to standardize on a specific version of the UI Kit, and to control when you upgrade to a newer version. At this time, each update of the UI-Kit-7 ruleset occurs in conjunction with a maintenance level release of the Pega 7 Platform.